I bought a packet of soy beans and was searching for recipes in the internet and came across this recipe. It’s simply soaking the beans overnight and roasting in the oven for 25-30 minutes. As soon as I saw this recipe, I wanted to try the same procedure with some other beans also. I had green mung beans in hand. So I soaked 1/2 cup of each beans separately with lots of water and a teaspoon of salt. Next day morning I washed the beans, drained the water and added some more salt and pepper powder and kept it for another 2 hours. I first tried the soy beans, did exactly what was mentioned in the recipe. I had to roast it for 25-30 minutes to get the desired crunch. As mentioned in the recipe, be careful at the end because it tends to get burnt during the last few minutes. 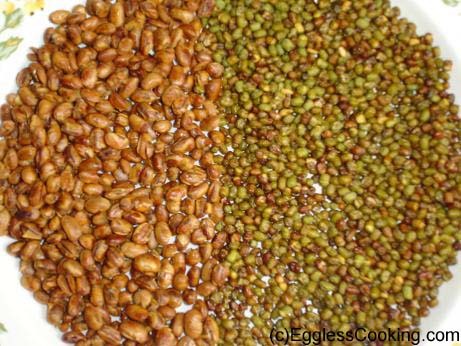 Roasting green mung beans was easier when compared to soy beans. The roasting time was very less; around 10-15 min is enough. Personally I liked roasted mung beans. But one word of caution, this has to be consumed on the same day itself, the next day it becomes very hard to bite. The soy beans was good even after 2 days. 1. You can add any seasonings you want, cayenne pepper, garlic salt, etc. 2. 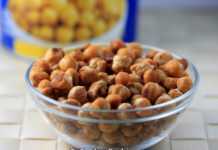 I think this method will work for chick peas (garbanzo beans), green peas also. 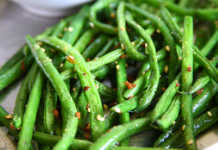 In that case you can have a healthy mixture of beans for snacking, which is rich in fiber and proteins. Previous RecipeIs it Baklava or Not? It’s your decision! Where do I find the soybeans? You can find it in most grocery stores in the canned food section. Funny thing, i’ve yet to find them in traditional grocery stores. And, when I have found them they are in cans and does not appear healthy. I finally found them in Chinese grocery stores. I want to roast up a batch of mixed beans and keep for eating over the next few weeks. Will these not keep? The mix you buy in the shop lasts for months? I don’t know Dave. I did a small batch and it was over within 2-3 days. oven at low temperature. The result is good. I will try without boil them. i love them i buy them at the local Nutters store here in canada and i have a allergy to nuts so the roasted soybeans have a good texture and salted to give me that crunch it almost feels like i am eating peanuts… thier so good and if i remember only $0.79 cents per 100 gram that is so cheap… hmm hmmm good. sorry just seen the answer to my post above! mmm i love these snacks but i’ve ordered them raw from my usual store as they’re not cheap in the supermarket ready made! ive ordered some soya beans [raw] do i have to boil them before i roast them after soaking? i know they have natural toxins in them, like kidney beans i just want to be safe and not sorry! @Diane: I think it would definitely work out with pinto beans too. Maybe it would require some more time in the oven. Try it out and let me know. Actually one of my friends told that she was able to get the same results using a microwave oven with soy beans. You could try that also. Wow that looks so easy to do! And healthy munchy snacks too! I’ve got some pinto beans too do you think they’d work? Hi Michelle, you need not boil the soy beans at all. Just soaking overnight is enough. Now that you have boiled it, I don’t know how the outcome will be. I would do either of the following: One previous visitor had mentioned that she just cooked the soaked soy beans for 6 minutes in the microwave oven and it was nice and crunchy. I would try that first instead of pre heating the oven and then roasting it or just use it in some salad or soup. Try roasting another time just soaking the beans. Hope this is helpful. Do let me know the outcome. I want to roast the soya beans i have left to soak overnight, sofar i have boiled them for at least one hour, do i put them straight in the oven or is it wise to let the beans cool overnight in the fridge and then roast tomorrow…help!! Thanks Jayasree. Your version is very simple. I’ll also try it and update my post. Hi, I tried roasting soya bean in MW. Followed your recipe and it was perfect and crunchy snack was ready in less than 6 mts. Thanks once again. Thanks Jayasree and Roma, will definitely check it out. Even I was looking for some recipes for soy beans. I soak them along with whole wheat for making dosas. Thanks for the recipe. TBC, don’t tell me you are lazy. You have whipped up so many desserts including baklava. Vaishali, even I’m not a big fan of soy nuts, just wanted to give a try. But both my mother in law and myself loved the mung beans very much. Dhivya, Ranji, Akay, Kaykat, Cham, Uma very glad you all liked it. Thank You. yes, this is a good post with useful info. Great munching beans. Thanks for sharing. this snack is really healthy!! !thanks for sharing!!! That was very innovative of you, Madhuram. I am not a huge fan of roasted soy nuts, but I love mung beans, so can imagine these would’ve tasted great. Would be a nice snack to munch on , on a rainy day like today ! Indira at Mahanandi does have a lot of such recipes.